The state-run telecom operator Bharat Sanchar Nigam Limited has launched a new lineup of brand new plans recently to compete with other telcos in the market. These new plans are known as BSNL Happy Offer plans. The operator has unveiled five new prepaid plans under its Happy Offer lineup. These plans are starting from just Rs 187 and available at up to Rs 999. These prepaid plans provide more flexibility for customers to choose best plans according to their need. So, in this article, we are going to know about BSNL Happy Offer details and the benefits of BSNL prepaid plans unveiled under this new lineup. This is the first plan under BSNL Happy offer lineup. The prepaid plan provides unlimited data and unlimited voice calling benefits to any local & STD number. Apart from that, this plan comes with 100 SMSes per day. The plan comes with the validity period of 28 days providing 28GB of high-speed data and 2,800 SMSes. This is the second plan comes under the BSNL Happy offer. This plan provides more validity than the previous one. It comes with unlimited voice calling (Local + STD) & 100SMSes per day. The plan also provides 1GB data per day and is valid for 54 days. It provides even more validity period than earlier plans. The validity period of this plan is 91 days which is around three months. The data cap has been set to 1.5GB per day. Apart from that, the plan also provides 100 SMSes per day for free along with unlimited local and STD calls. This is the fourth plan under BSNL Happy offer lineup, and it also provides 100 SMSes with a day and 1.5GB data per day. But the plan comes with 129 days of validity which is huge. It also gives unlimited calling benefits (local + STD) without any weekly or monthly cap. BSNL 999 plan is the most expensive plan under this BSNL Happy offer lineup. 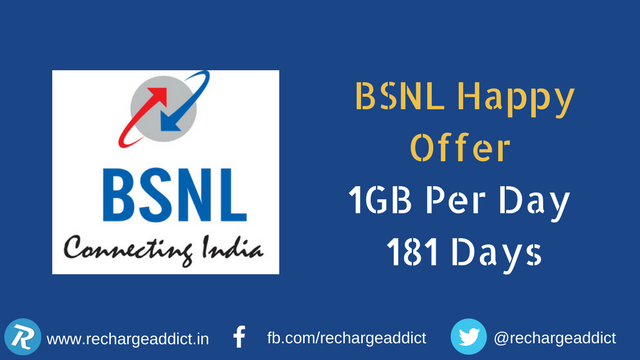 Though it’s expensive than other plans, it is a value for money plan for BSNL prepaid customers as the plan offers validity period of 181 days. The plan also provides 1GB of high-speed data along with 100 SMS each day. And voice calling is also free, and there is no weekly or monthly limit on both local and STD outgoing and incoming calls. As Bharat Sanchar Nigam Limited does not have any 4G network yet in any circle in India, all the data benefits available with these plans under BSNL Happy Offer provides 2G or 3G data according to the type of network available in a given area. Now, let us know your thoughts on these new BSNL prepaid plans in the comment section below.